Having owned the monochrome GameBoy, it seemed logical to buy the Color model. I remember having high hopes that the Game Boy Color would have a birght screen, full color and eye-popping imagery. My eyes did pop out, but it was from trying to tilt the unit at the right angle in order to see anything on the screen. I remember finding virtually no way to position it under a lamp so I could see the screen and avoid glare from the lamp. Damn tough unit to play. The processor, which is a Z80 workalike made by Sharp with a few extra (bit manipulation) instructions, has a clock speed of approx. 8 MHz, twice as fast as that of the original Game Boy. 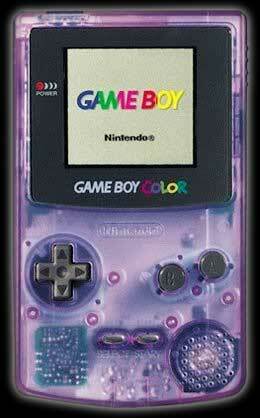 The Game Boy Color also has four times as much memory as the original (32 kilobytes system RAM, 16 kilobytes video RAM). The screen resolution was the same as the original Game Boy, which is 160x144 pixels. The Game Boy Color also featured an infrared communications port for wireless linking. However, the feature was only supported in a few games, and the infrared port was dropped for the Game Boy Advance and later releases. The console was capable of showing up to 56 different colors simultaneously on screen from its palette of 32,768, and could add basic four-color shading to games that had been developed for the original Game Boy. It could also give the sprites and backgrounds separate colors, for a total of more than four colors. This, however, resulted in graphic artifacts in certain games. For example, sometimes a sprite that was supposed to meld into the background would be colored separately, making it easily noticeable. In Super Mario Land, there are many hidden sprites (in the form of hidden enemies/opportunities) exposed by using a multicolored palette. These and other "spoilers" can be avoided by using the monochromatic color palette as described below. In The Legend of Zelda: Link's Awakening (original version) there is an area full of statues, some of which are enemies and some of which are normal. The enemy statues blend in normally but the palette trick in the GBC makes them stand out. In Pokémon Red and Blue, the inside of the Fuchsia City Gym contains a maze made of hidden walls which normally cannot be seen. These walls are exposed when using a multicolored palette. Additionally, trainers in dark caves that would normally be hidden can be displayed as silhouettes using certain palettes. Games that are designed specifically for, and therefore will only work with, the Game Boy Color or the Game Boy Advance, are housed in clear-colored cartridges. Games that are designed for the Game Boy Color, but which also include backwards-compatibility with the previous Game Boy systems, have a similar design to the original grey Game Boy cartridges, but are colored black for identification. The European and American releases of Pokémon Gold, Silver, and Yellow feature different-colored cartridges, although they are technically identical to the standard black ones. When playing an original Game Boy game on a later system, the user can choose which color palette is used. This is achieved by pressing certain button combinations, namely either A or B (or neither) and a direction key while the Game Boy logo is displayed on the screen. These palettes each contain up to ten colors. In most games, the four shades displayed on the original Game Boy would translate to different subsets of this 10-color palette, such as by displaying movable sprites in one subset and backgrounds, etc. in another. The grayscale (Left + B) palette produces an appearance essentially identical to that experienced on the original Game Boy. In addition, 89 Game Boy games have a special palette that is enabled when no buttons are pressed. Any game that does not have a special palette will default to the dark green (Right + A) palette. Notable games that do have preset palettes are Metroid II: Return of Samus, Kirby's Dream Land 2, Super Mario Land, Tetris, Bart Simpson's Escape from Camp Deadly and the Wario Land series. The default palettes are stored in a database within the internal boot rom of the GBC, and not the game cartridge itself. Super Game Boy titles will work too. Despite compatibility with Super Game Boy titles, the Game Boy Color will not recognize the coloring header for Super Game Boy titles which have a color graphics system of its own. The Atomic Purple Game Boy Color system has a purple tinted translucent case. It is a standard color. The last Game Boy Color game released in Japan that was also compatible with the Game Boy and Super Game Boy was From TV Animation - One Piece: Maboroshi no Grand Line Boukenhen! (July 2002). This gave the original Game Boy (1989-2002) one of the longest continuous lifespans of any console, only beaten by the Atari 2600 (1977-1992), and the Neo-Geo AES/MVS (1990-2004). Its North American lifespan was shorter though, as the last Game Boy and Super Game Boy compatible game released there was Dragon Warrior Monsters 2 (September 2001). However, the last Japanese Game Boy Color-exclusive game "Doraemon no Quiz Boy 2" was released in October 2002. In the US, the last game was Harry Potter and the Chamber of Secrets (November 2002).